These simple tips will help you with car organization and keeping it clean. Having a clean car isn’t just a sign of neatness, it is a safety feature. Car organization prevents accidents. Accidents are frequently caused by objects shifting in a car or rolling under the driver’s feet. 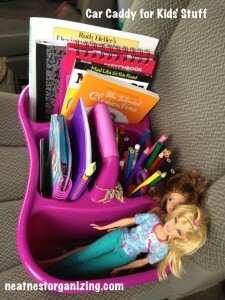 Use a car seat caddy to car organization with games, toys, snacks, and moist towelettes before road trips. Use a fold up cloth makeup case to pack first aid supplies and slide it into your car door for extra organization. Use an expandable file for organization of papers in your glove car box. Not only will it help with your car organization, it will simplify your life. Use a sun visor in your car for organization of pens and sunglasses. Purchase or sew a pet seat cover to add to your car organization. It will save your upholstery from stains and dog hair. Carry a blanket or sheet in your trunk to cover your car seats for extra organization when hauling dirty kids from ball practice. Keeping dirt and grime out will help with your car organization. Car organization includes trash disposal. A simple waste container can fit between the seats in back. You can make your own out of a flip top cereal container or a paper covered box. Your car trunk is an often overlooked upon car organization. An unorganized trunk is a disaster in the event of a flat tire or a roadside emergency. You will not regret your car trunk organization when you don’t have to clear your trunk at the side of a highway. At Sallas Auto Repair, we want to make your life on the road easy with car organization tips, car care tips and more — in and outside of our office.